On behalf of Iraq and Afghanistan Veterans of America (IAVA), we would like to extend our gratitude for the opportunity to share our views and recommendations on improving women veterans’ access to quality health care and services. IAVA recognizes the important contributions of women veterans, who have a long history of serving honorably in the armed forces. As the leading post-9/11 veteran empowerment organization (VEO) with the most diverse and rapidly growing membership in America, we have a diverse group of women veteran members and leaders in our midst. We are proud to have them as a part of our organization, we value their voices, and we value their service. This March, we launched our first ever women veterans survey as part of an effort to understand more about women’s experiences during and after service. Over 1,500 women veterans have responded so far, sharing their experiences with VA healthcare as well as more broadly the challenges they’ve experienced as women veterans transitioning back into the civilian community. In addition to this survey, IAVA’s research department traveled to seven cities across the country and spoke with dozens of women veterans in an ongoing series of women veterans’ focus groups. We’ve had women from all eras of service attend these groups, and they have provided us with vital information for this hearing today. In speaking with our women veterans across the country, we’ve narrowed our suggestions here today to three main points. First, VA, DoD, and the nation at large must recognize women for their ongoing service to this country. Second, the VA specifically needs to expedite planned improvements to VA facilities to support and improve services and care for women at these facilities. And finally, there must be a renewed focus on research to fully understand where gaps in services exist for women veterans. Women have played a vital role in our military throughout history, and their impact and contributions are continuing to grow. In the recent wars alone, nearly 280,000 women have served. While the number of male veterans is expected to decline in the next five years, the women veteran population will increase and is estimated to reach 11 percent by 2020. And yet, what IAVA has learned while traveling the country is unfortunately not surprising. Women veterans continue to encounter barriers to care and benefits, including an overall culture that does not fully recognize or accept them as veterans. Far too often, women are not recognized as veterans and are even confronted with individuals that seem to ignore their service. Last year, during IAVA’s advocacy campaign, Storm the Hill, one of our own IAVA veteran members experienced a group of fellow veterans thanking her for her support while thanking her male colleagues for their service. Recent IAVA focus group data illustrates this type of disconnect is widely reported, with less than 40% of women veterans reporting they felt U.S. public treats their military service with respect. These frequent instances of dismissing or ignoring women’s military service must change, and nowhere is that more necessary than inside the walls of VA medical facilities. As one woman told us, when she tried to sign up for veteran-specific mental health services, administrators told her “Oh, no. That’s not for you. Those are for veterans,” almost going as far as to slap her hand away. From our initial analysis of the women veterans survey, which is still open, less than half of respondents (45%) agreed or strongly agreed with the statement that VA employees treat women vets with respect. Other veterans are constantly addressed as “Mr,” regardless of whether or not this is correct. As one of our members describes it, VA has “made great strides in instituting women’s clinics, program coordinators. But it is difficult to believe it is changing when I get letters addressed to “Mr.” When I read my medical chart, and I am referred to as “him”, when I enrolled at this VA, Eligibility listed me as male…simple things but what it says to me is that we still don’t matter as much.” These women are tired of having to defend their service because they don’t look like the stereotypical veteran. There is no reason that these women should not be recognized in the same manner as men who have served, especially when seeking care at the VA. Our members are active users of VA medical services – the initial results of our women veterans survey show that 70 percent of respondents are enrolled in VA healthcare, and the majority have been enrolled for over 2 years and have sought care within the last 6 months. Military service is not dependent on gender – and we need all VA leadership and employees to know this. It is clear that in reaffirming its values and mission, the VA must ensure it is reaffirming its commitment to ALL veterans. We suggest that as a first step, VA medical centers implement staff training programs to counter these assumptions and emphasize the importance of women’s service being recognized. Additionally, the role of the women veterans’ program manager should be strengthened within to VA to ensure this position is given the necessary authority to implement policies. Building on this culture change, the need for an inclusive and welcoming environment is not restricted to the staff at VA centers, the VA must also allow patient advocates to be trained and prepared to handle complaints at every VA medical facility related to harassment or individuals creating a hostile environment in order to enact real culture change. Second, VA medical centers need specific operational and structural changes that support the needs all veterans. Only 56 percent of women veterans who responded to IAVA’s latest member survey felt the VA provided an adequate number of women practitioners, only 41 percent believed the VA provided an adequate number of doctors specializing in women’s care and only 34 percent said the VA adequately provided specialized facilities. These statistics or issues are not new and are well known throughout the veteran community, but the need to address the disparity in gender-specific care remains. In our recent focus groups, women consistently pointed out that they’ve had to endure long wait times to get care from a provider that they trust or are trained in women-specific medical fields. While our women veterans survey is still open, our initial analysis shows that about 70 percent of respondents rated the VA as fair, poor or very poor in their support provided to women veterans. Among those who have used private healthcare, only one in four rated private care as fair, poor or very poor. Our veterans deserve providers who are fully trained and able to provide care to both men and women, professionally and effectively. The VA has made great strides to address these types of issues, but there is still a need for the VA to ensure every VA medical center has appropriate facilities that are fully staffed to support the needs unique to women veterans, such as women’s clinics. From our initial women veterans survey results, only about half of those enrolled in VA care said the VA facility they last visited had a gynecologist on site and less than half reported a women vets coordinator or program manager on site. We have also heard about the impacts of a lack of privacy on the quality of care provided. In the words of one of our members, “The VA should understand that women and men have different needs and at times may need their privacy. Being at the doctor or in a hospital can be traumatic at times, but worrying about your privacy can make it worse – for any person.” The VA already has the tools to implement best practices for safety and privacy for women veterans, which were outlined in the March 2010 Government Accountability Office Report on VA women’s health care policies and oversight, now the VA must establish and enforce deadlines to meet those best practices. Third and finally, there must be renewed emphasis on good data and reliable research delving into the experiences of women veterans. Gaps in services and improvements in care cannot be fully achieved unless they are fully defined. If we are to move forward as a nation that honors the service and sacrifices of women veterans, we will need to actively include these women by inviting them to drive the conversation through participation in research, program evaluation and policy implementation. The VA has already taken steps in the right direction here, with the establishment of the Center for Women Veterans, the renewal of the charter for the Advisory Committee on Women Veterans and the recent Women’s Health Research Conference. There is much work to be done with regards to understanding women veterans. The VA, DoD, and Department of Labor, among other government agencies, should make additional improvements to their research by incorporating gender and minority analyses into all reports to better inform gaps in services and programs. Specifically focusing on the VA, VBA must track and analyze all rating decisions by gender to ensure accurate, timely and equitable decisions by rating specialists. To date, VBA does not as part of its regular analyses consider gender. And so, while there is anecdotal information of women having difficulty filling for these benefits, there is no data to identify whether a problem truly exists. I think what most sums up this testimony is the observation of a female veteran of Vietnam who attended one of our focus groups. As she left, she noted that while there has been some progress, by and large it has not been enough, and certainly not fast enough. Many of the challenges that existed when she transitioned to VA care decades ago still exist. With the women veteran population only projected to increase, the time to address these issues is now. IAVA would like to thank you for bringing these issues to the forefront, and giving us the chance to offer our views and the views of our members here today. We look forward to continuing to work with each of you to recognize the contributions of women veterans and improve their access to high quality healthcare. 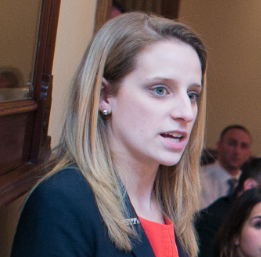 As Legislative Associate, Lauren maintains Congressional relationships, supports advocacy programs, and comments on policy matters in the media. She is a U.S. Army veteran that has extensive experience working on veteran policy issues focused on education, health care, disability claims benefits, and employment. 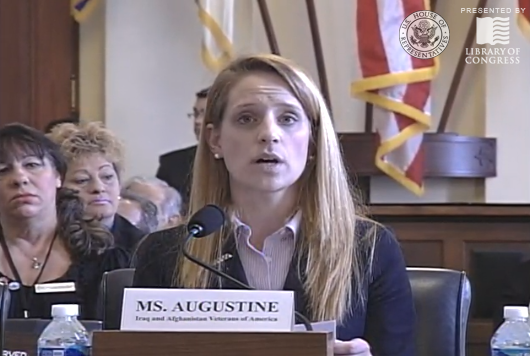 Neither Mrs. Augustine, nor the organization she represents, Iraq and Afghanistan Veterans of America, has received federal grant or contract funds relevant to the subject matter of this testimony during the current or past two fiscal years.